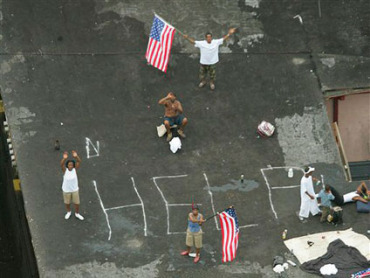 This week marks the tenth anniversary of Hurricane Katrina, which made landfall on the US Gulf Coast on August 29, 2005. The world looked on in horror as events unfolded a decade ago. The storm surge that accompanied Hurricane Katrina breached New Orleans’ hopelessly inadequate levee systems, flooding four-fifths of the city. Tens of thousands of residents, unable to escape the storm’s path, were trapped in their homes, in many cases clinging to rooftops, without food or drinking water. Thousands remained stranded for days in horrific conditions at the New Orleans Superdome. Hundreds of patients were trapped in hospitals that had lost electrical power. At least 1,800 people were killed across five states by the hurricane and the catastrophe that followed. One million people were displaced from their homes and forced to move to cities throughout the region. Amidst the plethora of media commentary already produced for the anniversary, there is little that speaks to the real significance of these events. The tragedy that struck the city of New Orleans, along with coastal areas from Florida to Texas, was not simply a natural disaster, but a social and political crime. The devastation wrought by the storm exposed the reality of American capitalism—the Third World levels of poverty, the pervasive inequality, the disastrous consequences of decades of neglect of social infrastructure, the stunning incompetence of the political establishment, the indifference with which the ruling class treated one of the most important economic and cultural centers of the country, not to mention its working-class inhabitants. That a serious hurricane could produce such a disaster was neither unforeseeable nor unforeseen. Scientists had warned that New Orleans’ levee system was inadequate to protect the city from a direct hit. Yet nothing was done. It was known that a breach of the levees would lead to mass flooding. Yet no evacuation plan was put in place. As the storm approached, residents were urged to leave on their own, but thousands lacked the means or resources to do so. There was no mechanism in place to provide public transportation, medical assistance or emergency aid to alleviate the human suffering caused by the floods. The response of the Bush administration to Hurricane Katrina came to epitomize its particular combination of stupidity and ruthlessness. While the government ensured unlimited resources for waging war abroad and, in the name of “homeland security,” building the framework of a police state at home, it washed its hands of responsibility for the disaster. Rejecting federal initiatives to aid victims of the hurricane, Bush urged the American people to make contributions to charitable organizations. Both Democrats and Republicans have blood on their hands for what happened a decade ago. For 25 years, administrations of both parties had diverted social resources from infrastructure and social programs and funneled them into the coffers of the corporate and financial aristocracy. Subsequent efforts to cast the government’s response to Katrina primarily in terms of “racist Republicans” conveniently ignored the role of Mayor Ray Nagin, a former executive for Cox Communications. He personifies the layer of African-American politicians in the Democratic Party who have long promoted right-wing, pro-business policies. It was Nagin (who was later sentenced to ten years in prison for corruption) who oversaw the policies of the city in the years following Katrina. The destruction of New Orleans was seen by the ruling class as an opportunity to restructure class relations in the city and make it a model for the entire country. In the decade since the hurricane, virtually the entire public school system has been dismantled or handed over to for-profit companies. Major public housing projects have been razed. Charity Hospital, founded in 1736 to provide for the poor and indigent, was shut down in 2005 despite minimal flood damage, depriving thousands of uninsured residents of a crucial source of health care. Entire sections of New Orleans were depopulated. Tens of thousands who fled have been unable to return. The official population of the city collapsed from 455,000 to 208,000. Today, it is 379,000, according to the latest figures from the US Census. However, in some neighborhoods (including the Lower 9th Ward, which was among the hardest hit by the flooding) the population is still barely a third of what it was a decade ago. Other sections of the city, such as the Tremé neighborhood—a historic center of jazz and working-class culture—have been gentrified. The ruling class used Katrina to accelerate a social counterrevolution that was already underway. The assault on public education and social services and privatization of public assets carried out under the cover of “rebuilding” New Orleans has since been extended to Detroit, under the auspices of a dictatorial “emergency manager” and the federal bankruptcy courts. The financial equivalent of Katrina, the 2008 Wall Street crash, has been used under President Obama to carry out an unprecedented transfer of wealth from the working class to the rich and the super-rich. Hurricane Katrina has laid bare the awful truths of contemporary America—a country torn by the most intense class divisions, ruled by a corrupt plutocracy that possesses no sense either of social reality or public responsibility, in which millions of its citizens are deemed expendable and cannot depend on any social safety net or public assistance if disaster, in whatever form, strikes… The central lesson of New Orleans is that the elementary requirements of mass society are incompatible with a system that subordinates everything to the enrichment of a financial oligarchy. These basic truths resonate all the more clearly ten years later.